Main Street’s two principals, Michael Mercadante and Tevere MacFadyen, have some 60 years combined experience directing and coordinating all aspects of interpretive planning, design, production, fabrication and installation. Michael and Tevere have a hands-on relationship with all of our firm’s projects. Tevere directs and supervises the programmatic aspects of our work, including interpretive planning and concept development, content research and development, image and artifact selection, and graphic design. Michael assumes primary responsibility for dimensional design, including exhibit and project-related architectural design, and he also monitors project budgets and schedules to ensure compliance with established guidelines. 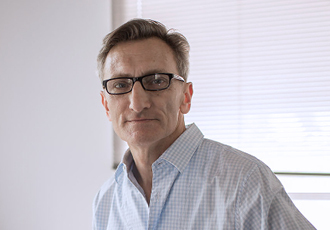 A registered architect in the Commonwealth of Massachusetts, Michael is the President of our firm, and he directs all dimensional aspects of Main Street’s work. 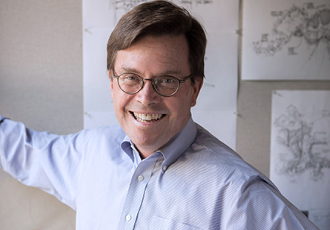 He earned his degree in architecture from the University of Notre Dame, where his studies included a year abroad at the University’s architecture program in Rome, Italy. Since 1983 he has worked exclusively in the field of interpretive exhibit design. Michael has served on the Program Committee of the Association of Zoos and Aquariums, and he is currently Treasurer of the Executive Committee of the International Board of the Themed Entertainment Association. Tevere is Main Street’s senior interpretive planner and exhibit developer, and he provides overall design direction and concept development for many of our firm’s projects. An exceptionally capable and flexible workshop leader and facilitator, Tevere’s talents are particularly valuable in guiding the development of complex initiatives during their critical formative stages. An accomplished author, Tevere’s published books include Gaining Ground: The Renewal of America’s Small Farms, an early and influential profile of the sustainable agriculture movement; Barns, Beams and Boats, about the preservation of traditional boatbuilding on the Maine coast; and Circle of Seasons, with the photographers Sonja Bullaty and Angelo Lomeo, a celebration of New York’s Central Park.